As many vendor experts would point out, marketing automation is more than just “guided email”. It’s a complex, supportive system of lifecycle marketing assistance. Marketing automation brings together things like keyword handling, lead generation and email marketing customization with other components that help shepherd customers toward conversion, and bring more power to internal sales and management teams. Get our Marketing Automation Software Price and Cost Guide. Here are three tools that make a good case of presenting themselves as lifecycle marketing automation platforms. The Marketo marketing automation package provides diverse tools and resources for handling leads, SEO, analytics intake, and more. A number of leads support tools look at things like cross-selling and up-selling, as well as customer retention and the ability to identify leads with the most potential. On the social media side, Marketo helps make it easy to set up things like polls, surveys, contests and special online events through social media platforms. These are the kinds of events and social marketing methods suggested by so many consulting firms to boost visibility and enhance customer participation, and the platform brings these closer to busy executives. Marketo also offers connections to Google AdWords, intelligent forms for landing pages, and A/B testing for email campaigns. There’s also Customer Experience functionality built into Marketo; the suite supports tools for making cross-channel customer experience more consistent and personalized, for instance, with tailored in-app mobile messaging that can speak directly to a given customer. Other elements of the Marketo package make things clearer for salespeople. For instance, working with leads gets easier, because of visual “flame” icons used to identify the hot prospects. And with CRM integration for both Salesforce and Microsoft Dynamics, Marketo is making a place for itself within the marketing automation industry. Oracle Eloqua is another lifecycle marketing automation resource that gives companies the ability to monitor leads, prospects and eventual conversions. In the area of lead management, Eloqua offers proprietary Co-Dynamic Lead Scoring™ for lead analysis and the ability to generate sales qualified leads. about customers and their behaviors — what they searched on a website, what pages they looked at, what brought them into a relationship with the business. Customer testimonials point out that using Eloqua is a way to stop flailing blindly in the marketing world, to use more sophisticated outreach methods to get better results. Eloqua offers “visibility into performance and pipeline”, with email marketing analysis that will help guide online campaigns. There is also CRM integration with the Eloqua Integration Studio, a specific environment that helps port in data from Salesforce or some other CRM agent. Although it’s packed with functionality, Eloqua exists in the context of a greater B2B package from Oracle that combines the power of marketing automation with broader business intelligence tools, and more. Another marketing automation choice, Hubspot, starts at the beginning, with things like SEO optimization and keyword selection and analysis support. Like other marketing automation tools, Hubspot Workflows helps to craft specific SEO campaigns that are likely to get attention from the right kinds of customers. Other tools also help with this kind of targeted outreach. There’s Smart Content for personalizing outreach to customers, as well as dynamic forms that present just the right amount of data to a user, for example, hiding or collapsing complex and confusing sets of fields that may be useless in a given sales or support context. There’s also the idea of Master Ads, which brings a more guided result to advertising, and other neat features such as color-coded tools to help identify the most valuable parts of a marketing campaign. That’s in addition to the lead scoring that helps identify top prospects for salespeople. Using a proprietary marketing database, Hubspot Workflows helps companies to set up automated workflows and to perform guided analytics, for example, drilling down into one marketing channel and figuring out how that’s working for the company. In addition, responsive design helps to present content through the Workflows platform to end users in just the right ways. All three of these marketing automation tools offer some power to refine and sustain intelligent marketing efforts. All three of them offer Salesforce integration and other key aspects of marketing automation. The difference largely lies in the details, for example, in how the CRM integration is done, to what extent it’s done, and to what extent analysis becomes easy and convenient for users. Take a look at all three of these platforms, to choose a marketing automation solution that has the muscle that’s required to help make tough decisions about any stage of the marketing process. 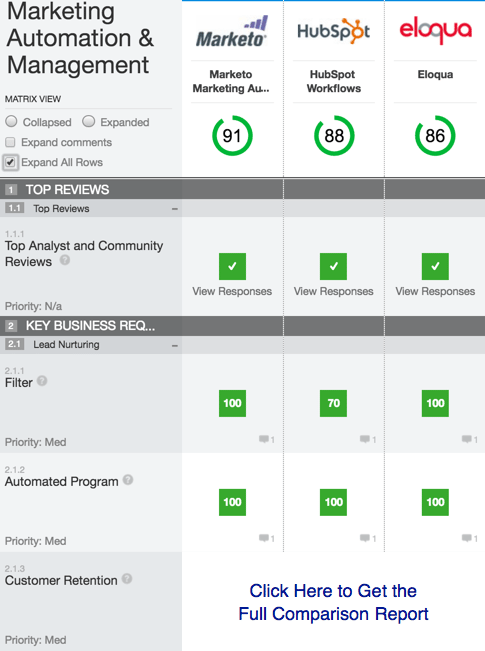 Get our Marketing Automation Comparison Matrix.